Two friends unearth something mysterious, perhaps even monstrous in the dark depths of the earth. The remove it from its resting place, only to find that perhaps something horrifying clings to the object, identifies with it even. Whatever it is, it is intent on making itself known through malicious and disturbing events. Sound familiar? Believe it or not, we’re not talking about the crone, who Dana and Greg Newkirk kindly (?!) introduced us to in ITF 53. But it did remind me of something similarly sinister which took place in the north east England town of Hexham during the early 70’s. It was in 1971, rather than the oft wrongly reported 1972, that two brothers named Colin and Leslie Robson dug up two strange stone-like objects in their back garden. Both seemed to be carved renditions of human heads. The first, seemingly made of green stone with embedded glittering quartz crystals, was skull-like and apparently bore the appearance of a male and was summarily christened ‘boy’. The literal sister head was considered more feminine and at the same time a little creepy, bearing characteristics not unlike a witch. Or a crone, maybe. Unearthing the stones and bringing them inside their house was catalyst to a series of strange, spooky and downright terrifying experiences the Robson family endured. It started with family members walking into a room, only to notice the heads had moved, apparently on their own accord. The family would go out for an excursion, return, and find them rearranged. Unnerving to say the least. The strange activity intensified, with the ‘girl’ head taking to flying across the room, it’s heavy impact on the wall echoing and resounding throughout the house with a chilling thud. Although it never broke, other things did. Glass bottles would explode and ornaments would be sent crashing to the floor. When broken glass was found strewn around the mattress of one of the Robson’s young daughters, both her and her sister insisted on moving to a room as far from the heads as possible. But it was the Robson’s neighbour, Ellen Dodd, who would first see an apparition. One evening, Mrs Dodd distinctly felt something delicately and carefully touch her legs. On looking down, she saw a strange entity on all fours. It appeared to be half man, half sheep and after moving away, it seemed to disappear. Later on that night though, Mrs Dodd heard a sickening cracking sound and screams coming through the walls. The Robson’s later divulged that the noise had been made by a shadowy creature that appeared in the house and looked not unlike a werewolf. The heads were passed to the Newcastle Museum of Antiquities, where they were examined, and assessed with dedicated non-committal apathy. Enter Dr Anne Ross, an academic who very enthusiastically labelled them as possible products of a Romano-Celtic head cult tradition. Surprisingly (or should that be suspiciously) quiet during their stay at the museum, upon moving in with Dr Ross they made up for lost time, with a part-man, part- animal creature appearing to walk out of her bedroom, which she saw upon waking one morning. In shock and intrigue, she followed the figure towards the kitchen, but seemed to lose track of it. A few days later, her daughter saw what she described as a werewolf on the stairs of the house, which leapt over the bannister and moved down the corridor towards the kitchen again before disappearing. It did however leave behind large, damp footprints in its wake. As other dark figures and the now familiar incidents of unexplained breakages and unease increased, the Ross’s also felt themselves shrouded by a cold, malevolent presence. 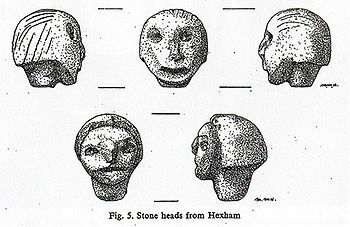 Dr Ross eventually removed all the Celtic heads from her collection, including the Hexham twins, resulting in the end to the unwanted activity. Curiously, some have attributed both the appearance of a sheep-man and a werewolf with the spirit of what was known as the Hexham wolf, an out of place animal responsible for widespread livestock slaughter in 1904. Well, you knew I had to get a killer animal in there somewhere! Shortly after their stay with Dr Ross, the Hexham Heads began a tour of various universities and offices of academics up and down the country. They eventually found their way into the hands of a Frank Hyde in 1978, who planned to carry out a number of dowsing experiments on them. They have never been seen since. It has been suggested that Dr Ross used the publicity surrounding the heads to bring the spotlight on her own work, something that seems likely given few others experienced the ‘poltergeist’ activity afterwards. Or maybe an earth spirit, like a water sprite attached itself to the artifacts in question. Dana and Greg described hearing rushing water and finding wet footprints on their sofa. The werewolf figure also left a trail of waterlogged footprints. In the case of Hexham, perhaps such an entity found a way home through Hyde, a dowser – someone who seeks underground bodies of water, gravesites and artifacts through divination. Or maybe the heads are still out there, terrorising and mystifying their keeper in equal measure to this day. If you missed Into The Fray 53, catch it here online, or with your favourite podcatcher. Luke Phillips is a writer and author on animal behaviour, cryptozoology and things that go bump in the night. Find his novel Shadow Beast on Amazon.